Long lashes can be yours today! I was given Moodstruck 3D Fiber Lashes as a gift and I was so excited to try it on my eye lashes to see if this product really does what it claims to do. 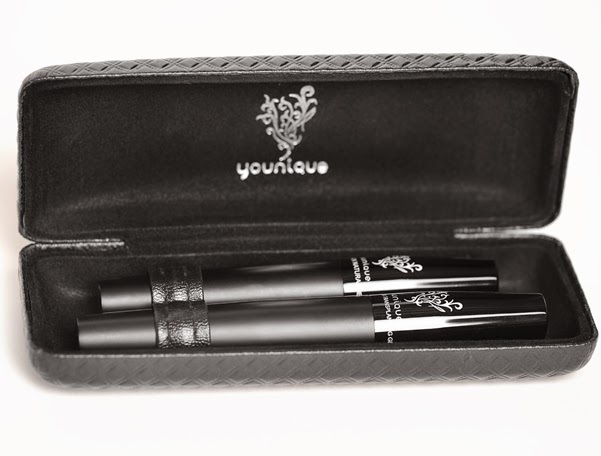 This unique 2-piece system is supposed to thicken your lashes by 300% and create volume with a realistic look and feel to them. There are two products that come in a beautiful and fashionable, black sturdy case with one tube of transplanting gel and the other tube containing natural fibers. I first applied a coat of my favorite mascara onto clean lashes, because you are supposed to put a little mascara on your eye lashes prior to applying the Younique Moodstruck 3D Products. Before my mascara was dry, I applied a coat of the transplanting gel and while it was still wet, I applied a coat of the natural fibers, then I sealed it with one more coat of the transplanting gel to seal the natural fibers to my lashes and prevent the fibers from flaking off onto my face. The natural fibers come in the color black and have a feather-like texture. Oh, my goodness, I was very impressed with how my lashes looked, they looked a lot like false eyelashes! My lashes appeared much longer, were thicker, and looked so beautiful. I was amazed with the finished results. Over the years, I have used many eye lash lengthening mascaras, but did not like the way the products felt on my eyelashes, however the Moodstruck 3D Fiber Lashes feels great and has a lightweight feel that lasts all day. It does not irritate my eyes and I can actually sleep with the product on and wake up in the morning with my eyelashes still looking lush and long. I know you can apply more than one coat of fibers to your eyelashes, but make sure that you do not apply too many coats at once, because one time I did that and experienced black, feathery fibers dropping onto my cheeks. So, I would advise you to take your time with this product if you want or need to apply more than one application. I have used many different mascaras by various brands and applied many coats of mascara on my eyelashes before, but nothing I used or did ever made my eyelashes stand out and look as thick, long, and beautiful as the Moodstruck 3D Fiber Lashes makes them look. Another neat thing about this system is that the fibers are made from 100% green tea. I love to drink green tea, because it contains antioxidants that are very good for the body. Since green tea is beneficial when consumed internally, I know that it is just as beneficial for external application on eyelashes. It is water resistant, but comes off easily with soap and water. After applying the transplanting gel and fibers, I just place it back in its handy carrying case until I am ready to use the products again. Moodstruck 3D Fiber Lashes is a little pricey, about $29.00, but it is well worth it. What price would you pay for extremely long, thick, and gorgeous lashes?